Pine honey is honey of high nutritional value and this is mainly due to the large number of different substances present in its composition. Among these substances are the minerals and trace elements (calcium, magnesium, zinc, iron, copper, etc. 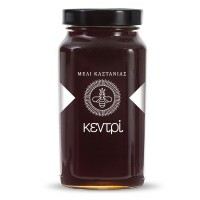 ), which are in high concentrations in Greek pine honey. Our beekeepers, with the utmost care and attention, are watching and keeping the bee swarms healthy and robust throughout the year so that they can collect the best possible raw material and process it in the hive under the most favorable conditions. 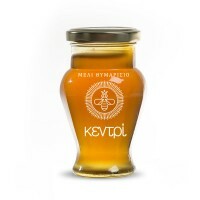 Thereafter, the quantities of honey and other products are transferred to standard facilities where, without the removal of ingredients or the addition of extraneous substances, without heat treatment, destroying their natural enzymes, their bacteriostatic property and vitamins, and without further interventions, blended, packaged according to the latest hygiene and safety standards to maintain their natural characteristics, nutritional qualities and excellent quality unaltered. Our honey, in every batch, is subject to rigorous laboratory tests to avoid the presence of antibiotics and other unsuitable substances. In conclusion, honey as a sweetener has significant advantages over sugar and we owe it to our diet as a substitute for it. So use honey as much as possible and reduce your daily sugar consumption to a minimum. In addition, the fragrances found in the pomegranate of Greek nature can stimulate the senses of the most demanding consumer. Season: May & from August to October. Flavor: not very sweet due to low sugar content. Color: slightly dark, but the autumn is lighter. Crystallization: Crystallization becomes slow, remains fluid more than a year. Nutritional value: pine nuts contain minerals & trace elements such as calcium, magnesium, zinc, iron, copper, etc.